Cook potatoes and cauliflower in boiling water in large saucepan 15 min. or until potatoes are very tender. Meanwhile, brown meat with onions in large skillet on medium-high heat; drain. Spread onto bottom of 13x9-inch baking dish; top with asparagus. Microwave Cheez Whiz in large microwaveable cup on MEDIUM 1 to 1-1/2 min. or until heated through, stirring after 1 min. Drizzle over asparagus. Drain potato mixture; return to pan. Add milk and butter. Mash until vegetable mixture is desired consistency; spread over asparagus. Traditionally made with lamb, shepherd's pie can also be prepared with beef. 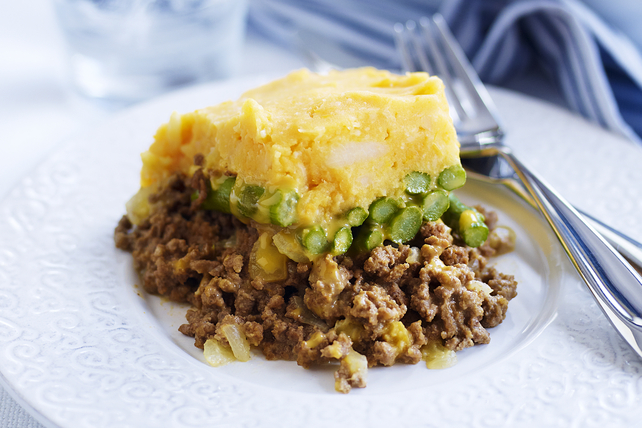 The beef version is often referred to as "cottage pie."